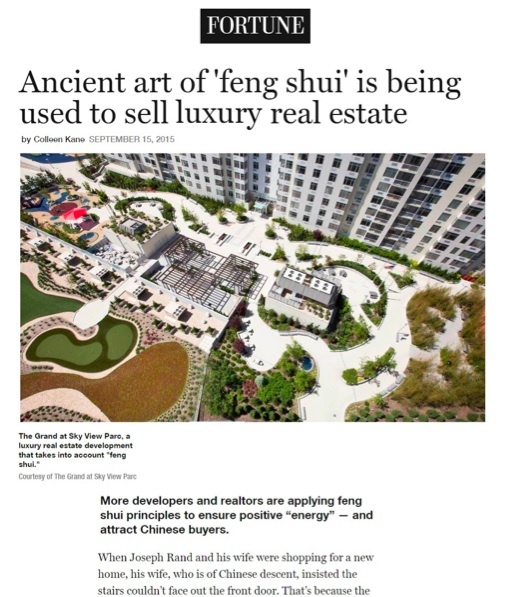 More developers and realtors are applying feng shui principles to ensure positive “energy” — and attract Chinese buyers. When Joseph Rand and his wife were shopping for a new home, his wife, who is of Chinese descent, insisted the stairs couldn’t face out the front door. That’s because the ancient Chinese design philosophy holds that all luck would flow out the front door. Rand, also a managing partner of Better Homes and Gardens Rand Realty, told the story as a way of underscoring the importance of learning the Chinese buyers’ cultural preferences, especially feng shui. This year, China surpassed Canada as the foreign country spending the most on residential properties in the U.S., comprising 16% of international home buyers. Chinese buyers spent an estimated $28.6 billion on residential U.S. real estate between April 2014 and March 2015, according to the 2015 Profile of International Homebuying Activity. The growing Chinese presence is partly why realtors selling luxury properties, in particular, are paying more attention to feng shui. A survey of 500 Chinese Americans conducted by Better Homes and Gardens Real Estate and the Asian Real Estate Association of America found that 86% think feng shui will make a difference in their future home buying choices. Additionally, 79% of these Chinese-American home buyers said they would pay more for a house that followed follow feng shui standards. Feng shui is a centuries-old philosophy, originating in China, that was used in homes and urban planning to create a calm, harmonious environment and improve the flow of “qi” or positive energy, which is thought to benefit the occupants. In modern homes, this flow is achieved by the layout and placement of furniture and other decor elements. Clutter-free environments are valued, and other key considerations include placement of mirrors (not across from the bed) and complementary colors. In feng shui-styled environments, the Five Elements of wood, fire, earth, metal, and water, are used in combination to align a building, site, or city to a healthy balance. According to the Better Homes and Garden Real Estate survey, three-quarters of Chinese Americans said they could see feng shui deal-breakers, such as a house’s location at the end of a dead-end street. Other feng shui buyer turnoffs include homes that have the front door and rear doors aligned. A bed placed in the “death position” — that is, with the foot of the bed directly aimed at the door — is one of the biggest taboos. Of those surveyed, 41% indicated this would detract them from buying the home right away. Respondents said they would pay an average of 16% more for a home that followed feng shui principles — such as uncluttered kitchens done in complementary colors, a full-length mirror and live plants in the bathroom, proper furniture placement, floor plan, and layout flow. Clearly, some home sellers can benefit from adopting some of the principles when staging their house, and that information has been offered from the likes of HGTV, and a cottage industry of feng shui experts has sprung up, offering their services. However, luxury housing developers have also taken the cue and are including feng shui elements in their amenities and floor plans. The Grand at View Sky Parc, a condominium development in Queens, New York features a rooftop park, integrating the feng shui elements of water, wood, fire, earth, and metal. The entrances were situated to counter negative energies, and the stones, plants, water and wood were placed strategically as well, with geometric forms creating layers of space. And feng shui has even moved on up to the highest end of real estate. Developers of the waterfront Ritz-Carlton Residences in Miami Beach, which will be priced from $2 million to $40 million, flew in Hong Kong feng shui expert Patrick Wong to work with the architect on incorporating feng shui principles. As one of his first tasks, Wong visited developer Ophir Sternberg’s home to evaluate it. “He wanted to make sure that the energy [in the home] was correct, and that we produce the right sort of building,” Sternberg told the South China Morning Post. After Sternberg’s home passed that first test, Wong set to work, choosing landscape plants, assuring the building is facing the right direction, that all units have proper flow and that they incorporate the elements of wood, fire, earth, metal, and water. Although the development won’t be finished until the end of 2016, more than half of the 127 units are sold.